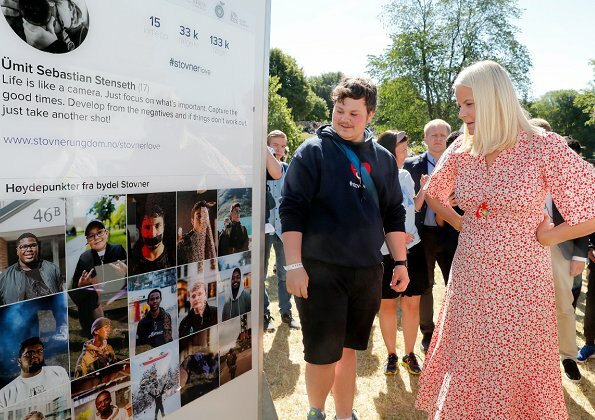 On June 12, 2018, Crown Princess Mette-Marit of Norway visited a culture festival the Kulturfest Tøyen that was held at Tøyen Park in Oslo. 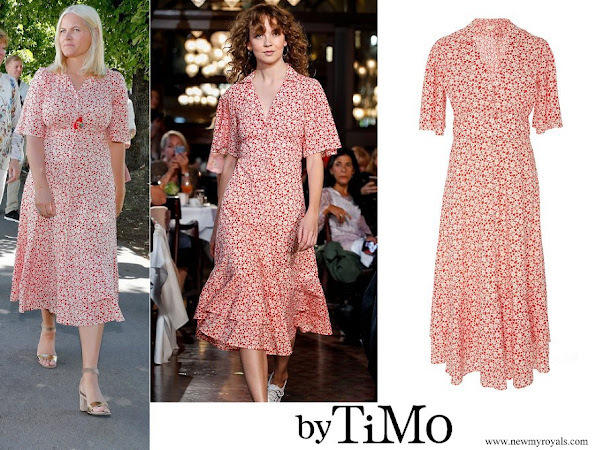 Crown Princess Mette-Marit wore a new cotton kitchen dress from by TiMo. Today's dress of CP MM is nice maybe a little to tight around the middle but it will do. Oh dear, I guess this is the style Mette-Marit likes. It looks better on the model, who happens to be wearing her size (unlike M-M). My thoughts exactly. At first I thought the dress is not too bad, but the comparison with the model changed my mind. Nice dress for a country event although not for MM. First pic., terrible posture, as if she were pregnant. No doubt MM has put on some weight and this dress doesn't help. CP MM is a wonderful person, I am sure of this. And she is a good example that it is not easy at all to dress always impeccable. Only few of us have this gift. The dress is OK (V-Neckline, right size & length). Sandals are lovely. Colour is good too. So, well done. She is a curvy woman, which I think is ok but she dhoush hire a stylist to help choose better, the dress is nice but this print doesn't help her and also it loklo too tight. It is a nice enough dress and looks cool and summery, but as in other things she wears, it is tight through her broad shoulders. The sleeves are too far up at the top. I wonder if she has ever had a designer make one to her own measurements. The Duchess of Cambridge had the same problem early in her marriage, trying to wear clothes made for a shorter-in-the-torso person than she is. Princess Charlene has enormous "swimmer shoulders" and must have things made to fit her, too. 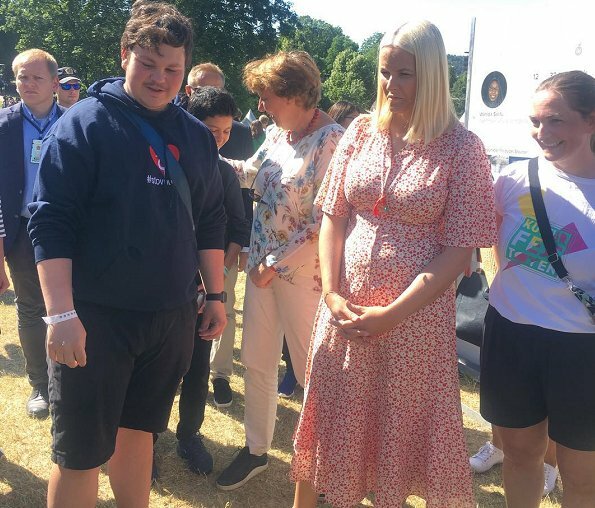 I would imagine that properly-fitted clothing would feel and look so much better for Mette-Marit. @ KH you described the problem with MM's clothes very well. Shoulders and top part of this dress are just wrong for her proportions, which is so often the case and destroys the whole look. It makes her look overweight, which she is not. She is tall, curvy and has an athletic, sporty figure. She should stay away from these overly feminine, girly, floating dresses with ruffles. It is simply not her style. A good stylist would know this and could guide her. It is a shame, she buys expensive brands, but they never look right. Her bad posture adds to that odd look. You find such bad posture often with tall women who try to look feminine. It just doesn't work. When MM wears casual outifts, the whole appearance is totally different. She then is herself. @ Beth: totally agree:"When MM wears casual outifts, the whole appearance is totally different. She then is herself." She is a wonderful woman with a wonderful classic face, a normal-weight and feminine figure but she hasn't a good look for clothes which suit her. Sometimes she does it super but most of the time it unfortunately isn't successful. Netherless this red / whhite dress is not so bad as the flower pattern skirt some days ago. Agree with both of you 100%. Good analysis. The right fit is not rocket-science, it can be done. And it is absolutely crutial for an elegant and finished look, not to mention how much more flattering it would be. But despite her contacts and resources she doesn´t seem to get it right, and no-one seems to care to help. 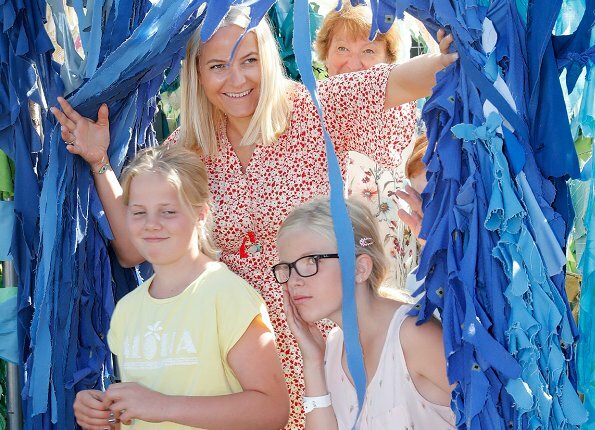 Mette-Marit, much like Victoria, should stay away from these floaty ruffly floral dresses and instead go for sleek, structured outfits. They both are sporty types who look best in casual outfits. For their more formal outfits, both day and evening, sporty, simple elegance with clean lines would suit them best. Why does she insist on wearing clothes that are designed to hold her ....in the breast region but are actually making her sag. If she had a supportive bra this would be fine. But the hanging "fruit" is not very attractive. I get that she wants comfort. But she is Crown Princess and some hippie chick Mother Earth running in the grass barefoot letting it all hang out. "Hippie chick Mother Earth running in the grass barefoot"! Ha ha ha, Diane! I enjoyed that comment, too! OH dear this dress is a bad choice. The fit is not good but she seems to gravitate towards this type of dress. Princess Mette-Marit of Norway in red dots dress looks very elegant and fabulous.